Similes are very useful in adding character to writing. 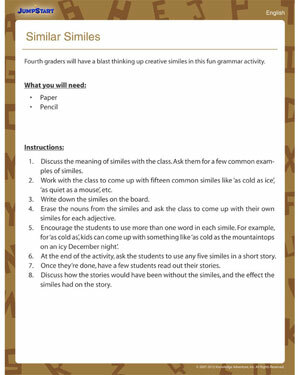 Help your fifth grader understand more about this important part of speech with the entertaining grammar activity, ‘Similar Simles’. After understanding all about similes and giving examples of common ones, students try to come up with similes of their own. These original similes are then used in writing and analyzed to understand how important they are.